Limerick defender Fiona Hickey has called on the camogie authorities to reassess the rules of the sport after yesterday's All-Ireland final between Cork and Kilkenny was marred by a controversial officiating performance. Referee Eamon Cassidy received a lot of criticism after Cork's 0-14 to 0-13 win for the amount of frees he gave during the game, with Orla Cotter converting the winning placed ball in injury time following a hotly debated decision. 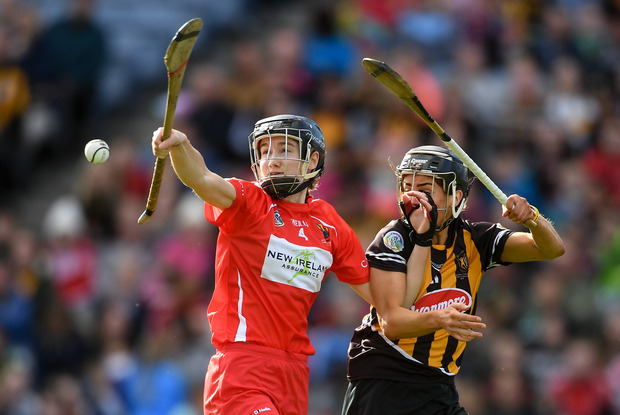 Camogie is currently a non-contact sport but speaking on The Throw-In, Independent.ie's GAA podcast, Hickey said that as players continue to get stronger and more powerful, the rules should be brought more in line with hurling so that the participants can utilse their athleticism. "Looking yesterday, some of the girls were so physically fit and strong and that's the way the game has gone but the rules haven't changed," Hickey said. "Eamon [Cassidy] was probably playing to the rule book with most decisions. The rules need to change somewhat because girls are becoming more physically strong. That's where you get your advantage. "Girls want to be as strong and as powerful as they can be and the rules at the moment probably aren't allowing for that. I definitely feel they should reassess the rules. Nine scores from play in an All-Ireland final isn't enough for people." Hickey added that yesterday's final was a disappointing spectacle due to the constant whistling, and that the referee's performance 'ruined the game'. "We shouldn't have to talk about this - it should be all about the camogie," Hickey said. "Unfortunately, everything that has been said in the media about yesterday has all been about the referee. People are right. It has to be brought up and things have to change. It ruined the game."